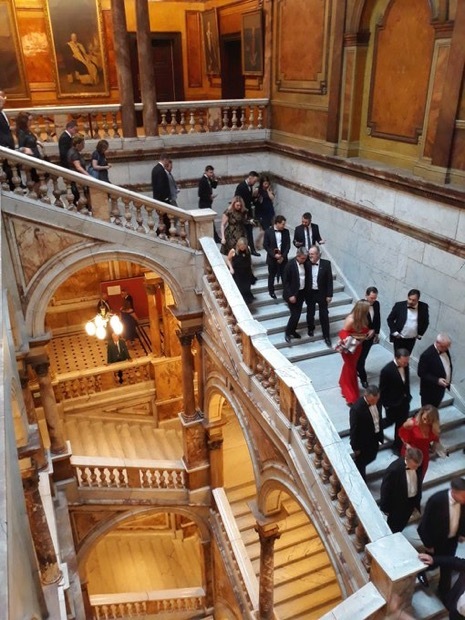 It was a glamorous affair at the Second Annual Causeway Awards Night at the Glasgow City Chambers. High profile business people from Ireland and Scotland were treated to a drinks reception in the beautiful Picture Gallery, hosted by the Rt Hon Lord Provost Eva Bolander, followed by a delicious dinner in the magnificent ballroom. Sponsored by leading engineering consultancy, Jacobs,The black tie event was attended by 180 delegates. Joe McHugh TD, Chief Whip and Irish Minister of State for Gaeilge, Gaeltacht and the Islands and Scottish Economy Secretary Keith Brown MSP were also present on behalf of both the Scottish and Irish Governments and gave rousing speeches. Joe McHugh stated “I would like to congratulate Causeway on a very successful second year championing Irish-Scottish business links and developing trade and investment between Ireland and Scotland". Keith Brown said that “Causeway has played an active role in encouraging businesses to explore the opportunities that exist in both our markets”. We had some fantastic prizes for our raffle which was in aid of Glasgow based charity Refuweegee, including a star prize of a return trip to Donegal from Glasgow courtesy of Tourism Ireland and Loganair. Thanks again to all our sponsors Jacobs, Fexco, CMS, RSM, Enterprise Ireland and Represent and congratulations once more to our worthy winners on the night. We look forward to seeing you all again next year at our Awards Ceremony- and at many Causeway hosted events between now and then.